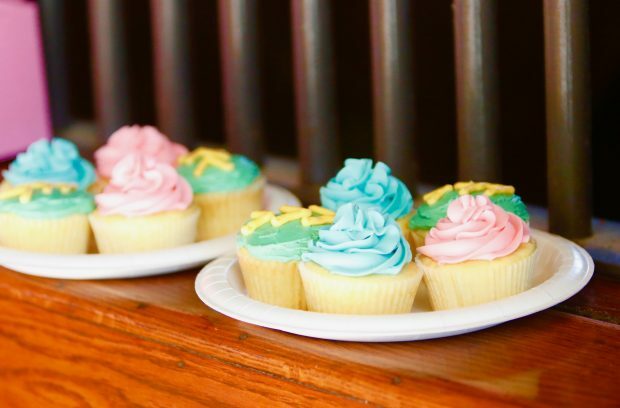 We’re a little late sharing this news, but we couldn’t leave you without photos of our filly’s first cupcake! 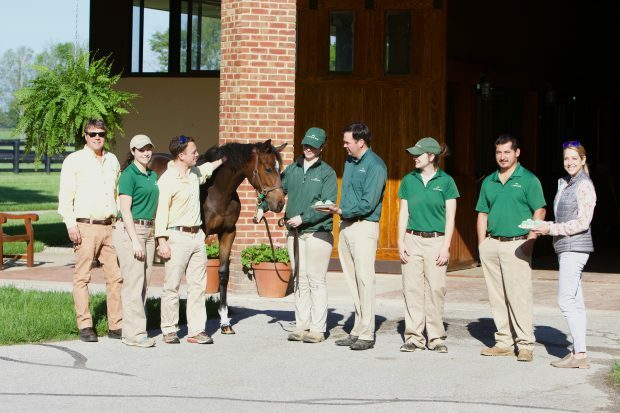 Zenyatta’s 2017 Medaglia d’Oro filly celebrated her birthday last week, and the staff at Lane’s End threw a party. Thank you, Lane’s End! Scroll down for more photos from Alys. Great race, can’t wait for the Belmont. Awesome royal wedding, they did it their way. Happily, read that all the horses came back from racing on that messy track OK.
Good for Moosie. Wishing Hawk Wing well. . RIP SDC. On the De Sousa facebook is a video of Coz playing in the water. So cute. He is one happy horse. Yes, love that video of Cozzie. Thanks for posting the video link of Cozmic One enjoying his shower! The Windsor greys were gorgeous as were the black horses — a lovely scene to be sure! COZ seems so happy and content in his new life. Wonderful. Loved this video of Coz! He looks so happy and fulfilled. He looks so into what he is doing. I met him many times at santa anita. He never looked comfortable racing. He looks happy and fulfilled now. Great choice for him now. He really “gets it” in his new career. So happy for him!! Lovely photos of this precious filly. Thank you, Alys. Thanks for the beautiful photos of Z17! She’s gorgeous and it looks like she enjoyed her party. There will be a minute’s silence across the UK at 2.30pm as we remember the 22 victims and all those injured in the Manchester Arena bombings.A home grown terrorist Salman Abedi detonated a bomb at the end of an Arianna Grande concert knowing he would kill many youngsters enjoying a night out.The Duke of Cambridge and Prime Minister Theresa May will attend a service of remembrance. Sadly on this day in 2013 Fusilier Lee Rigby was brutally murdered on the streets of Woolwich by Michael Abebologa and Michael Abebowale.Lest we for these innocent victims of terrorism. How right you are. The pomp and ceremony distracts from where the real power lies in the UK. The Queen only says what the Prime Minister tells her to say. That’s the way the system works and it’s not going to change. Wishing one of the greatest hurdlers Istabraq a very Happy 26th birthday .He lives in luxury. at JP’s stud Martinstown.Always recall his exploits at Cheltenham Have a fun day darling boy.Love and hugsX . Happy Birthday, Istabraq! May you be healthy and happy for many more. Best wishes to Oscietra, too! Have a good retirement, lovely one. Good luck to you as a broodmare. Hope our wonderful Biscuits will enjoy his time in Japan, and good luck to him in his stud career. Lots of love to you, MYB, and stay safe! Thanks for these news items, Sheena. The daughter of Black Caviar Oscietra is to retire.A winner of 2 of her 5 starts the owners feel she will be more valuable as a broodmare and Mind Your Biscuits is off to Japan to stand at stud next year.Prince of Caviar is to make his debut this saturday. Wish Biscuits was staying home. From what I have read, this farm takes wonderful care of these horses. Wish him the best and hope they will post photos from time to time. I’m sure Gunny will miss him. Quevega and her beautiful Walk in the Park filly. 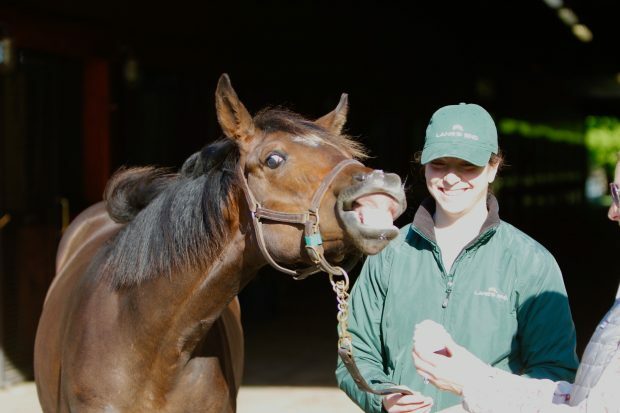 Prayers for Leslie’s Lady; safe foaling and healthy baby. Quite a few chicks will be hatching soon. I am sad, sad, sad. Biscuits has a respectable pedigree with Deputy Minister, and Roberto among others. Awesome Again for example. If not Kentucky, I was hoping for New York. If they want to go out and of the country, go to Toronto. It was good enough for Meghan. Adena Springs is near there. JudyB. I think of how much these guys give and then to end up so very far away from their home. No news ever about Zenyatta’s brother. Very upsetting. Those two wins by Biscuits in Dubai. I will never forget them or him. Very sad that Biscuits will be going to Japan. At least where he’s going has a very good reputation for care of their horses, though. I hope that Biscuits will be at Saratoga this summer and that I will get to see him before he leaves. I am very disappointed and sad about Biscuits, too. I was hoping that he would be in Kentucky or at least somewhere in the States. Will sure miss him. Saw a picture of Medaglia de Oro today in my Bloodhorse email. He is such a handsome fellow Zenyatta must have swooned when she saw him. Their daughter is absolutely gorgeous. 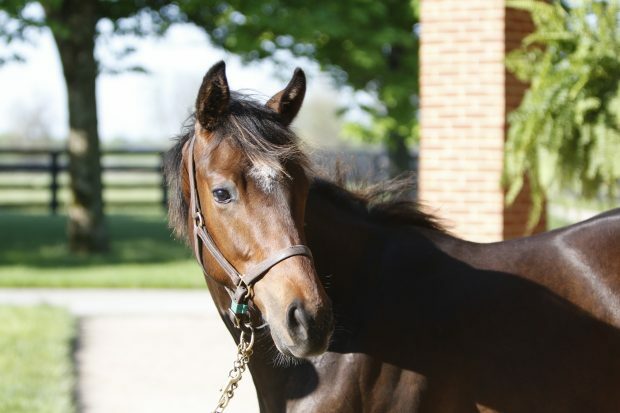 Love you, Z.
Zenyatta’s filly is such a pretty girl! Growing up so big so fast. Nice to see some pics of her, thank you! Hope Zenny is doing good and enjoys the Kentucky summer. 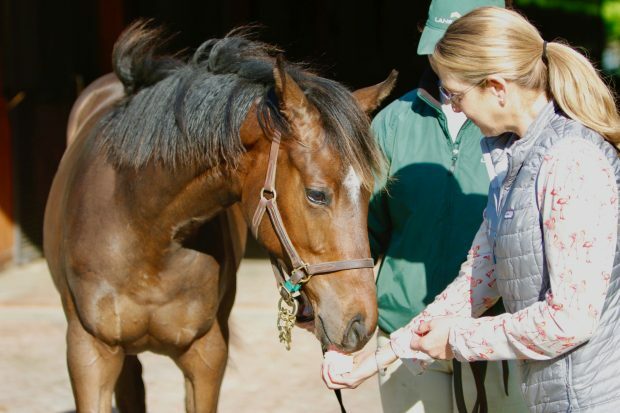 Thank you to Lanes End and all of Zenyatta and filly’s connections for taking such great care of our girls! I see alot of Mags in this filly as well though…and that is a gooooood thing! I hope her foot issue she had at birth is done and healed. I have not read anything about it so I’m assuming she’s ok? When will filly have her name? I’m so looking forward to watching Filly’s progress. Watching her half-sister Wonder Gadot this year, I have high hopes for MD’O x Zenny.